I came home from the West Coast with sunburned knees, pistachio shells rattling around my camera bag, and kept pulling ticket stubs out of random pockets. It was 11 days, 9 games, 6 ballparks. It was also one of the greatest trips I have ever taken. Here’s a recap of the trip, with background, planning insight, and tons more awesome photos. We landed at LAX around noon on 7/15. First stop was Anaheim (via a stop at In-and-Out Burger) in the shiny red Mustang we were upgraded to at the rental lot. 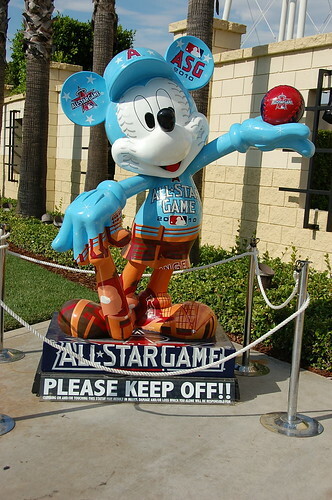 Anaheim at any time of year is crazy but in the summer it is insane from Mouse Tourism, and we wanted to be as far away from that as we could. I found the one hotel which is walking distance from Angel Stadium, and although we were trying to use points to defray hotel expenses and this was a Marriott, we booked it. They, of course, were just recovering from the All Star Game, but had a flux of Mariners fans coming in to town for the series. It was also very, very hot. It’s the kind of heat that makes you understand why native Californians drive distances New Yorkers wouldn’t even hail a cab for. By the time we got drinks at the AM/PM just down the street from the hotel (another plus) and made it to the Big A for photographs, we were already sweating. We are Easterners; we underestimate how much water we need to drink; we would replicate this error the entire trip. 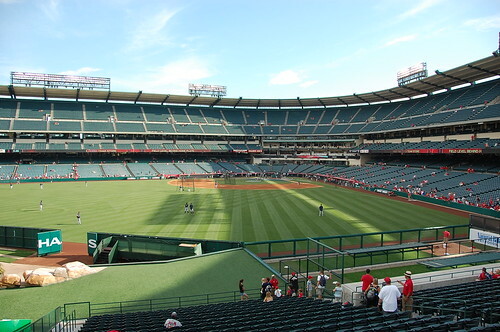 Angel Stadium was a surprise because we expected it to be more of a dump. It was a surprise, because it started to rain during the first inning. It was hot and over quickly so it was welcome, but it was definitely the last thing either of us packed for. We stayed until the end of the game and had dinner at a nice upscale sports bar called The Catch which was right at the entrance gate. As would become our pattern, the post-game dinner usually revolved around the largest salad we could find. It was our way of balancing out the rest of the food consumption. 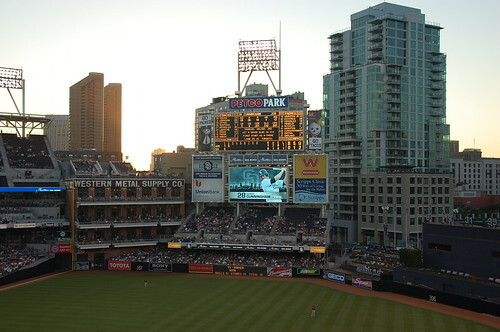 Most surprising ballpark: PETCO Park. It was on the list because it was on the list, but I can’t wait to go back there for a weekend series. Least surprising ballpark: Chase Field. It’s a combination of Milwaukee & Houston in terms of feel and architecture. However, the world’s genuinely nicest people work there. 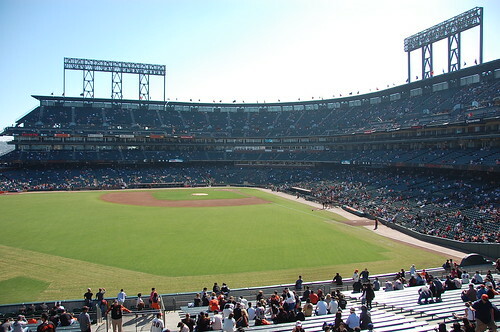 Not As Bad As You Think: Oakland Coliseum. Oakland reminded me of our dearly departed Shea, if anything. From Anaheim we piloted the Mustang down to San Diego, where we returned the car and grabbed a cab to the hotel. We stayed downtown, the ballpark is downtown, there’s a trolley connecting them, and we were only there for one day. While San Diego was many degrees less hot than Anaheim, we still didn’t bring enough water along with us, ever. (This will start to become a theme.) San Diego was: ballpark tour, lunch, nap, back to park for game, dinner with local friend. It would be the first time we would see Dan Haren on this roadtrip, but we left the game early for dinner, and because our flight to San Francisco the next morning was at 7am. PETCO was just a fantastic place. “It isn’t like anything else,” TBF kept saying. 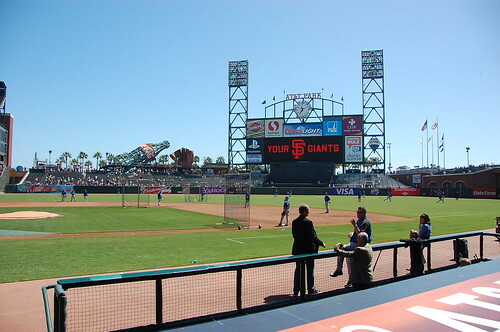 That’s not to say it’s the best ballpark ever, but that it was highly interesting and we were surprised by how interesting it was, because it never makes anyone’s lists, except Kevin Burkhardt of SNY, who always lists PETCO as his favorite. We had a list of places we wanted to make sure we saw at the park based on all of Kevin’s reports there over the years. Every time I mention it I get jumped on by people saying ‘Well it’s not PNC’ or insert your favorite ballpark here, and I’m not saying that it is suddenly The Best Ballpark In The Country. I will, however, state with perfect certainty that it is The Most Underrated Ballpark In The Country. It is the one we are most eager to return to for a nice three-game weekend series against the Mets some year. Biggest food letdown: the garlic fries at AT&T. TBF claims that my memories of delicious San Fran-area garlic fries are tainted by the fact that previous ones were consumed on very cold nights after waiting on a long food line at Shoreline Ampitheater during Bridge School concerts. He may be right. Most surprisingly good food: there was a fast food Mexican stand called Macayo in Chase Field. It was the most interesting thing I saw so I ordered from there, and we liked it so much we went back the next night. Thumbs up. A beat writer even recommended it to me after I had already found it. I tend to trust them when it comes to recommendation of food on the road. Only place I got sick from the food: Oakland Coliseum. We went with friends who were locals, and ate what they ate, thinking that would be safe. We flew Virgin America from SD to SF, and I wish I could tell you how cool it was, but we both fell asleep before takeoff, and the next thing I knew we were landing in San Francisco. Thanks to SF’s fantastic public transportation system, we were standing in the hotel lobby at 10am, where we dumped our stuff, found breakfast, and trekked out to City Lights bookstore and the Gap, where TBF purchased additional long-sleeve shirts, since it was FREEZING. We had long sleeves; we just didn’t have enough for San Francisco. Our hotel was a 15 minute walk from the ballpark, which was perfect for us. I always prefer walking, or a short public transit ride, to driving. We survived the Lincecum bobblehead carnage only to have to sit through a Brian Wilson save opportunity and a very, very long game. By the time we got back to the hotel it was so cold we abandoned a trip to the Mission for burritos, ordered room service, and crashed hard. We definitely underestimated how tired we would be and definitely overestimated how much free time we would have on the trip. We both brought our workout clothes and never got to use them once; TBF thought he’d finish his book by San Francisco and ship it back but he didn’t get through it until Phoenix; and although I bought a book at City Lights, I shipped it back in SF because at that point I knew I would not have any time. We would have picked up some extra hours in each city if I didn’t need to come back to the hotel to edit photos and write a blog post, but we knew that was a constraint going in. If I hadn’t done that, though, it would have been fruitless, because there never any extra time where I could have done it ‘later,’ and the photographs would still be sitting on my memory card and the posts would have never been written. Worst seats: San Diego. Upper Box Reserved, Section 319, $21 at the box office. They offered a nice view of the scoreboard, I could get the Western Metal Supply building in all my shots, and the visitor’s bullpen was directly below us. Best Seats: Dodger Stadium, 7/24. 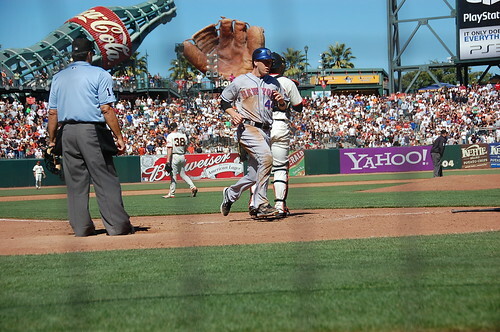 Seven rows up from the home dugout, between the on-deck circle and third base, we could see into the Mets’ dugout, could watch the Dodgers goofing around, and had there actually been any offense, could have enjoyed watching the batter run into home plate. If we learned anything this trip, it’s that this angle is our jointly preferred viewing point at a ballgame. Of course, day two in SF was a day game, so there was no rest for the weary. 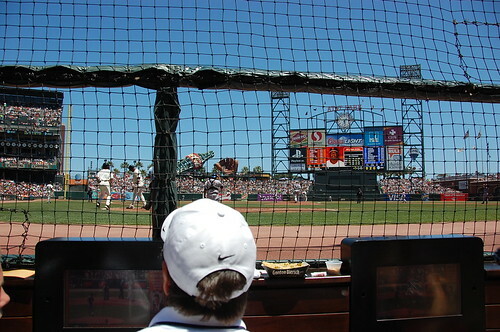 This was the day we had seats in the Lexus Dugout Club in the second row behind home plate (that’s the view from the photo at the top of this post), so we were going to get to the park as soon as the gates opened, so we could spend as much time in our seats as possible. We were visible on television several times during the course of the game. The Giants restrict access to BP just like the Mets do, and I have to say, even as a benefactor of this policy, that it is stupid. You know why? Because the seat holders in this area don’t show up that early, and the professional autograph collectors (read: sellers) just buy those tickets themselves and plant themselves at the corner of the dugout and preclude anyone else from getting close. 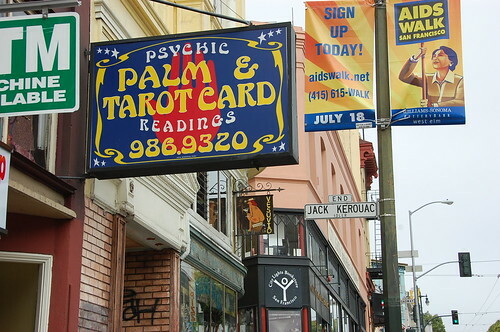 After surviving this game, we had plans to meet friends at a trendy dinner place in the Mission. We are lucky that they are also reasonable baseball people, and that they understand the need to follow something you love around the country, or the conversation might have been a little stilted. (Then again, these are the kinds of people with whom I have sat on cardboard boxes on the sidewalk for hours and hours while waiting for the Rolling Stones.) Alcohol was consumed. The food was delicious. We almost closed down the joint, and then came back to the hotel where I feverishly edited photos and went to bed as early as I could. 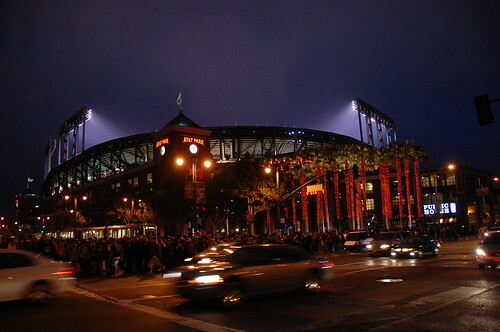 My regrets about AT&T Park: I didn’t order an in-seat Ghirardelli sundae, I didn’t get to go down the slide in the giant Coke bottle (it’s open to ‘fans of ALL ages’), and I didn’t get to peek through the portwalk in the outfield where you can watch three innings of the game without a ticket. Best Fans & Worst Fans: To be honest, I wasn’t impressed by any group of fans as a whole. We met great Dodgers fans, but everyone else couldn’t have cared less that there was a game on the field, and the reaction was “That’s just LA.” Giants fans hassled us to a degree that reminded me of Phillies fans (not something to aspire to, San Francisco) but yet the fans in Arizona could not grasp the concept that standing in front of me when there are two outs and the count is 3-2 was a bad thing to do and that I was going to get upset about it, and their response was that “you can get up whenever you want to” (now I understand these signs). But, funnily enough, in San Diego, it was Dbacks fans in town for the series that were the most attentive, while the San Diegans around us acted bored despite three home runs being hit in that game. Angels fans at least paid attention to the game, but only made noise when the scoreboard told them to. 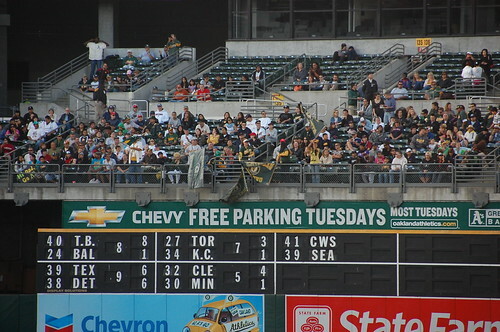 If anyone gets a gold star, it would have to be the fans in Oakland, who didn’t just sell their tickets and stay home during the Red Sox series, they represented at least 50% of the crowd in the ballpark that night.